M. Night Shyamalan Confirms 'Unbreakable/Split' Crossover Sequel! And suddenly I feel REALLY crappy about not seeing Split in theaters. >sigh< Anyway, beware of spoilers if you haven't seen M. Night Shyamalan's latest, his second hit in a row after The Visit. And you thought his career was over? Ha! He's about to do something that will undoubtedly bring all of his old fans back in a big way. So, the big twist to Shyamalan's Split revealed that it exists in the same universe as the director's cult favorite superhero origin, Unbreakable, which starred Bruce Willis as David Dunn, a man who discovers that he is invulnerable. 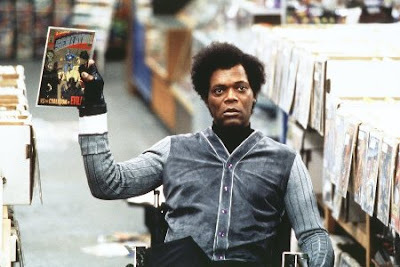 And now today Shyamalan has confirmed his next movie will be a Split/Unbreakable crossover titled Glass, an obvious reference to Samuel L. Jackson's villain, Mr. Glass. Ooooh boy. Willis, McAvoy, and Jackson are all set to return, along with Split's Anya Taylor-Joy. Ever since Unbreakable was released in 2000, fans have hoped for a sequel, largely stoked by comments by Shyamalan. It never happened, but Shyamalan teased his fans by saying the villain he planned for the sequel had been moved to a new, original film instead, and that turned out to be Split. So it seems we're getting what Shyamalan had planned all along, and I for one am stoked. The film already has a release date for January 18th 2019. I'm busting, Jerry, I'm busting!